Anyways, since my 5K is next weekend, I decided to head out about 7:15 to go for a 3.5 mile run. Honestly, I felt TERRIBLE through about the first mile. Usually it takes me about 2 minutes to get in the groove, but not this morning. I was struggling! But I made it through without stopping and actually decreased my time by 1 whole minute. Exciting stuff! I made it back from my run feeling tired but happy with my time. So I quickly came inside to stretch and cool off because my coffee was a waitin’! 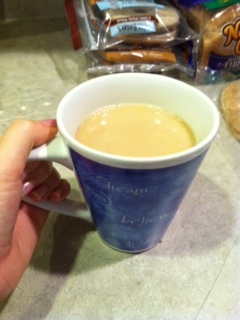 I’ve had about 2 of these large cups full of steaming coffee by now, and my caffeine high is pretty high. HA! Guess that’s a good thing for a Saturday morning. Once my appetite starting kicking in, I decided to whip up some banana pancakes that I had seen a recipe for on Pinterest last night. I changed up the ingredients a bit and they still turned out super tasty! Caution: The pictures look really terrible through this whole recipe because I’m really bad at making pancakes. But I guarantee if you like eggs and bananas, you will enjoy this easy breakfast! Heat a skillet to medium-heat and spray it with a non-stick spray. I use Pam Olive Oil spray. Once your bananas are well mushed, mix in the eggs. 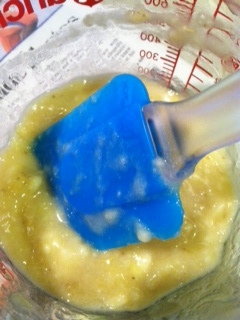 Beat the mixture well to thoroughly combine. Then add in the oats, vanilla, and cinnamon. 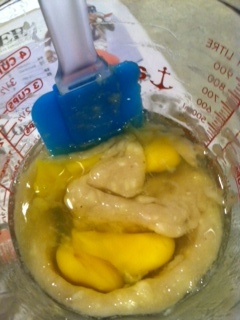 The mixture will be pretty soupy and runny! 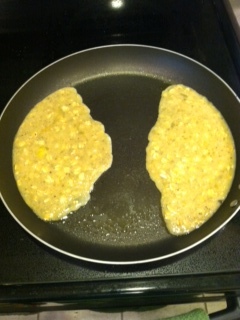 Once your skillet is very hot, pour out 1-2 medium sized pancakes. This is where the pictures go down hill. 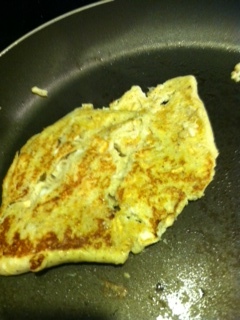 Lesson learned: My skillet wasn’t hot enough so the batter ran everywhere! I fail, but as it got hotter, I kinda reshaped the pancakes to salvage the first batch. Slightly better, no? Well regardless, they still tasted great! 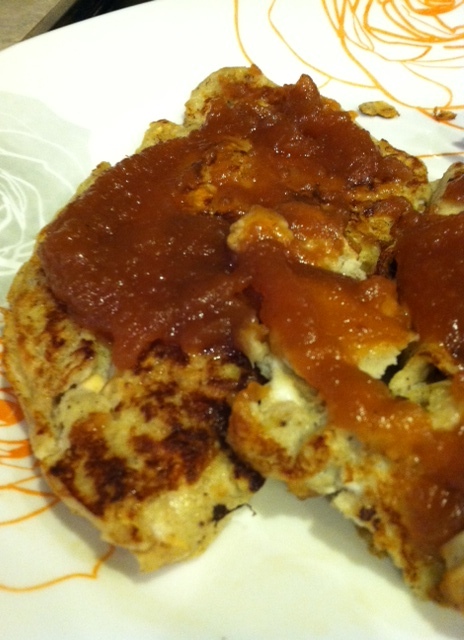 I topped mine with apple butter while they were still hot. Nick had the other half of the recipe with maple syrup. So feel free to experiment with your toppings! I still think the yummy apple butter wins though. This was a great, filling breakfast! I ate every bite off my plate. 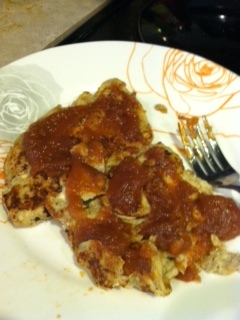 And with my apple butter included, it had just over 300 calories and 15 grams of protein. A great meal between my workouts today! I hope you all have a great Saturday! I’m heading off to Jazzercise soon. Then I’ll be spending some time with Nick and Mac for the rest of the day. Yay for having no special plans!